Two Georgia Southern University College of Arts and Humanities alumni took home trophies at the Southeast Emmy Awards in June in Atlanta. 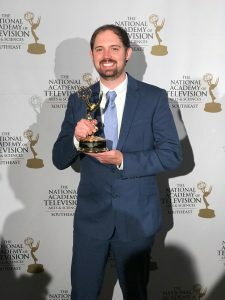 Jim O’Donnell, a 2012 communication arts graduate, received the Emmy for Director in a Newscast for his work as news director at WTOC in Savannah. Directing coverage of a recent tornado in the Savannah area helped secure O’Donnell the award. “There was a tornado that broke out in Garden City one day, and I put my iPhone behind me to record video of my directing,” he said. “I recorded my audio and recorded the 11 p.m. newscast that went out to our viewers. I couldn’t believe that I had made it to this level of achievement so early on in my career. 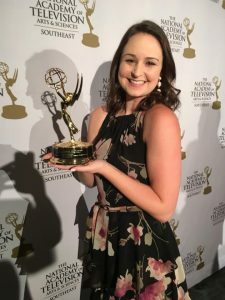 Kelly Krammes, a 2010 communication arts graduate, won an Emmy along with her coworkers at WXIA/WATL-TV in Atlanta for Special Event Coverage in the Edited category for “From Start to Finish,” which covered the Peachtree Road Race. Two other communication arts graduates were nominated for awards. 2010 graduate Danielle Jones was nominated along with her colleagues at WIS-TV in Columbia, South Carolina, for the Newscast — Daily award for the WIS News at 7. Bree Haggard, a 2014 graduate, was nominated along with her colleagues in the Journalistic Enterprise category for their work on “Todd Kohlhepp: A Killer Among Us” at WSPA-TV in Spartanburg, South Carolina. 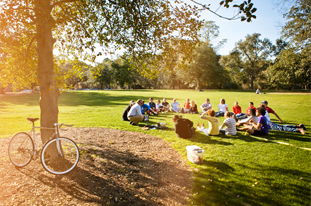 The Department of Communication Arts is housed in the College of Arts and Humanities at Georgia Southern. The department offers degrees in theatre, communication studies, journalism, multimedia film and production and public relations.